Chocolate ganache cake filling is a creamy, rich way to put your layer cakes together and is easier to make than you might think. With just two ingredients you can create this professional style filling for your cakes and other desserts. Leftover ganache, if there is any, can be chilled well and formed into chocolate truffles. Keep these refrigerated or freeze them for longer storage. There are basically two types of chocolate ganache cake filling and both begin the same way. Heat the cream in a heavy saucepan until it just gets ready to boil. Bubbles will form around the edges; do not let it boil. Remove from heat and stir in the chocolate until the mixture is completely blended. Ganache filling is dense and creamy, almost like biting into a chocolate truffle. Make the filling at least four hours ahead because it will need time to chill before you use it. Stir the chocolate and cream together but don't beat in any air. While the whipped ganache is light and airy, a regular ganache is dense and rich. The less air that is incorporated into the filling the more intense it will be. Use the best quality chocolate that you have available. While semi-sweet chocolate chips from the grocers will work, you will get a much better result by using a 60% to 72% bittersweet chocolate like Scharfen Berger or Valhrona. Heavy creams are not all alike; read the ingredients carefully. Some whipping cream is made with cream, skim milk and additives to make it whip. You want a cream that is just cream. Organic whipping creams never have the additives and are almost always the best choice. A whipped ganache cake filling has all the rich flavor of regular ganache but is lighter and airier. This filling is achieved by taking a well chilled ganache and whipping it at high speed until it looks fluffy and spreadable. Chill it for at least six hours. The ganache mixture must be very cold or it will curdle during the whipping process. Whip it just before you are ready to fill your cake and use it immediately. Don't overbeat or you will lose the creamy texture of the ganache and it will get grainy. If you refrigerate the cake be sure and take it out of the refrigerator at least 45 minutes before you want to serve the cake. The whipped ganache will become firm as it chills and lose some of the lightness when it is cold. There are numerous ways that you can flavor ganache. Just blend in a tablespoon of the desired flavor after the chocolate and cream are thoroughly mixed. 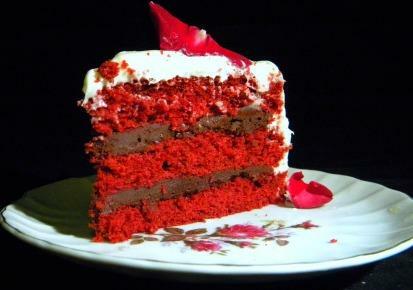 By using different flavorings you can have almost an endless repertoire of cake fillings and combinations. When you have used ganache in a cake filling or as a frosting, store the cake as well as any leftover frosting in the refrigerator. To make sure that the filling has that creamy, rich consistency that everyone loves, just let it stand at room temperature about 30 minutes or so before serving; adjust that time if your home is very warm or colder than normal. Ganache is an elegant, delicious way to finish your cake.